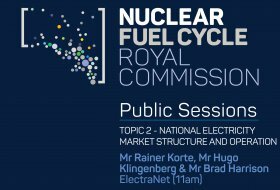 The Nuclear Fuel Cycle Royal Commission conducted a series of public sessions in which it received oral evidence on issues of interest to it. The sessions were streamed live and transcripts of the proceedings provided. The discussions followed a range of topics and were guided by questions asked by the Commissioner and Counsel Assisting, and helped form factual evidence in line with the Commission’s Terms of Reference.